The first weekend after the July 12 Philippines vs China arbitration ruling — the “7.12 Incident” — has passed without reports of major anti-foreign protests. There were, however, scattered cases of nationalist mobilization. There was at least one case of picketing outside a KFC in Hebei province (video), some smashing of iPhones (footage of which was often shared via iPhones), and a bunch of online dried mango retailers claiming to have switched their suppliers away from the Philippines. Together with the various patriotic outpourings online, this was probably the largest set of collective actions by Chinese citizens on the South China Sea issue yet seen in China — bigger than Scarborough Shoal in 2012, or the peak of tensions in 2011, though still probably smaller and less intense than the demonstrations that would likely have occurred during the 2001 Sino-American EP-3 incident, had authorities had not prevented them. While the Global Times hailed the “new wave of patriotism,” it was clear that, like in 2001, the party-state did not want real-world demonstrations. Municipal and university authorities were reportedly instructed to stay vigilantly on guard against potential mass gatherings. Nor, it seems, was online warmongering particularly desirable from the party’s perspective, with jingoistic Weibos encountering censorship. 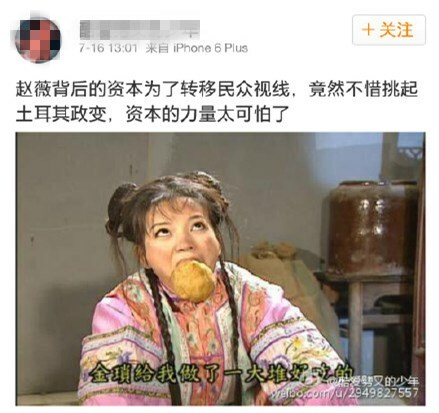 An article published on the Communist Youth League’s Weibo illuminates some of the reasoning behind this desire to keep the patriotic outbursts relatively mild. 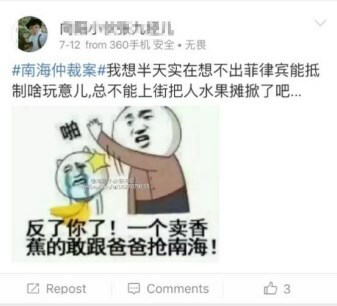 It argues that much of the extreme nationalist outbursts are in fact “next-level smearing” (高级黑, referred to below as gaojihei) of China’s good patriots by anti-party elements posing as extreme nationalists. Just how much of China’s ultra-nationalist output this actually accounts for is a wide open question. But the article offers evidence that it does explain at least some of the most visible and intense cases of what the outside world commonly understands as Chinese nationalism. In this way, it’s another illustration of how much more lurks behind shows of apparently anti-foreign mobilization besides simple “nationalist” ideology. Pushing for a war that would likely be disastrous for the party. The article is written by one of the Communist Youth League’s most energetic proponents of pro-party “positive energy” in both China and Australia. Besides being on the committee of the All-China Youth Federation, Lei Xiying is a PhD student at Australian National University, whose previous projects include the “take a selfie with the flag,” setting up an Association for PhD Students and Outstanding Youth Scholars, and heavy promotion of last year’s military parade. He’s a prolific political commentator in the PRC state media, as well as in the Chinese-language media in Australia. The author is, in short, a very worthy recipient of his Positive Energy Youth award bestowed on him by the Cyberspace Administration of China for being an “outstanding youth representative of online ideological construction.” As such, the article is illustrative of some of the issues facing the state’s leadership of popular nationalism on contentious foreign policy issues in the internet era, which i’ll return to briefly at the end. This afternoon a post-1995 netizen sent me a “patriotic” photograph that he found confusing. 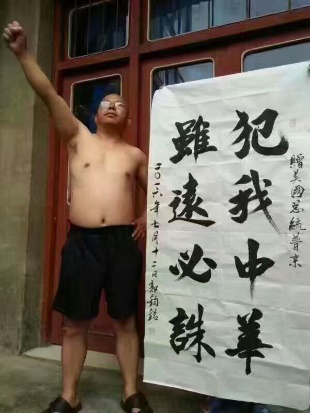 At a glance, with the slogan “violators of my China, however distant, must be punished” it’s a hot-blooded emotional “patriot.” But look a bit closer . . . Excuse me? [The calligraphic banner] is “a gift for US President Putin” . . . look again, a bald, bespectacled, half-naked, very inelegant “crazy uncle” with bad posture hits your eye . . .
Is this surprising? Actually no, it’s commonplace. Whenever big things happen in China, whenever the whole population’s patriotic sentiments rise, these kinds of gaojihei are sprayed out everywhere. 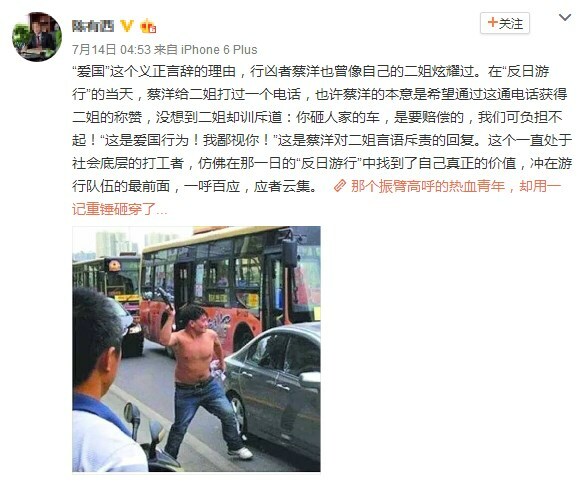 In one common gaojihei, Lei notes, netizens purported to blame actress Zhao Wei, who has again been the target of nationalist criticism of late, for masterminding the South China Sea arbitration decision, the Turkish coup attempt, and the Nice terror attack in order to divert attention from her sins. The initiators of this type of information are generally troublemakers, while those who forward it on are overwhelmingly ordinary netizens with naive patriotic sentiments — their heart is good, but due to their unfamiliarity with the internet’s complex public opinion environment, they are used by people with a purpose. Besides these, some groups who are normally very dissatisfied with the state, the current system and the present state of affairs, suddenly become interested in patriotism, and urge everyone to take to the streets, and take to the battlefield. The author then provides several examples of such suspects. Another concern is the attempts to link party-sactioned patriotism with the sickening violence seen in the anti-Japan demonstrations over the Diaoyu Islands in 2012. Some people take the opportunity to smear and exaggerate the behaviour of “extremist elements,” and use this to “represent” and “denounce” the rational behaviour of the overwhelming majority of patriotic youth, enacting maximum distortion on patriotism. Have we taken to the streets and smashed things? Committed violence? 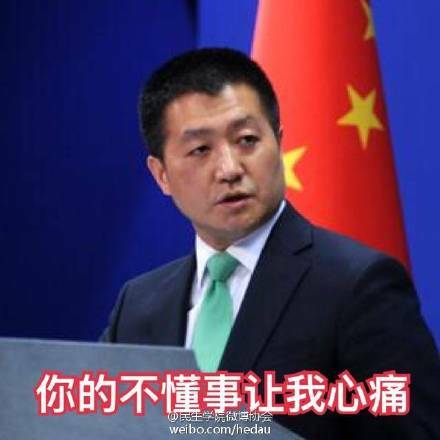 We are just playing with memes (表情包), OK? Please do not force these meaningless labels on us, OK? If you must label us, we are the ‘party of memes’ (表情包党), OK? We love the country but we do not arrest traitors, that was your generation’s hobby, our hobby is memes, OK? Thankfully, according to the author, the plot was thwarted thanks to the Communist Youth League sending out articles such as his own, discouraging any boycotts of any country’s products, and designating memes as the “patriotic form” of choice for today’s youth. this is why, after the 7.12 arbitration incident, we did not take to streets, scream protests, or even smash things up as some people had hoped . . . on the contrary we initiated a form of ‘mocking and scolding’ (嬉笑怒骂) unique to this generation. Not sure if the summary above hangs together at all — the article itself is similarly disjointed — but it does raise a couple of issues facing the state’s leadership of popular nationalism on contentious foreign policy issues in the internet era. First, as the Liu Yang quote suggests, the CCP state’s ability to tap into the power of popular nationalist mobilizations is significantly compromised by the moderate backlash their extreme elements generate. This point, borne out in Chris Cairns and Allen Carlson’s recent study of the 2012 wave of nationalism, has been recognized by other smart minds within the propaganda system. In a research interview in 2013, a state media employee familiar with audience costs theory observed that any international leverage China may gain from allowing domestic protests is greatly diminished when violence ensues. Not only does protest violence require suppression, thereby foregrounding the state’s ability to control nationalist outrage. It also brings forth strong anti-nationalist voices from across society, suggesting popular support for defiance of nationalist demands for escalatory foreign policy choices. 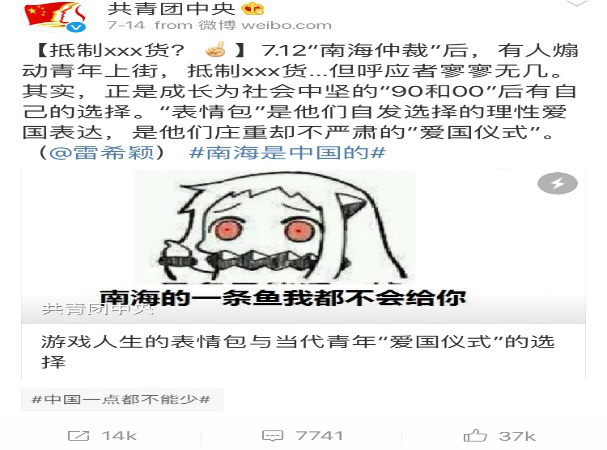 Second, perhaps reflecting the need to protect trade ties in a time of economic uncertainty, the CYL was clearly keen to specifically discourage boycotts among the youth, and substitute them with online “memes” (表情包). For the party-state to adopt these particular forms of internet-era youth expression as a vehicle for its propaganda makes perfect sense. But as a substitute for real political action it’s so openly inconsequential (and, due to the need for political correctness, humourless) that i wonder how this could possibly satisfy any genuine nationalist anger about the South China Sea issue — let alone the kind of general dissatisfaction with life that underpins at least part of it. This might be why some of the approved “memes” contained nods in the direction of slightly more violent Cultural Revolution-esque imagery (e.g. the one below). What else is going on here? What am i missing about this “meme” strategy? As always, thoughts, suggestions, corrections etc. most welcome. Thomas A. Mensah, Presiding Arbitrator of the Philippines vs China arbitral tribunal. Among Judge Mensah’s many qualifications, he was the inaugural President of the ITLOS, on which he served from 1996 to 2005. Contrary to PRC propaganda claiming the arbitral tribunal is “presided over by a former Japanese diplomat” Judge Mensah is from Ghana. Here’s a bit of speculation ahead of the UNCLOS arbitration decision on Tuesday, written for the Australian Institute of International Affairs’s website. My argument is that, however shrill and legally unconvincing the PRC’s propaganda campaign may seem, it will force the tribunal to take politics into account to an even greater extent than it would have otherwise — so expect some significant concessions to China. As Bill Bishop points out, the CCP has a long tradition of overcoming deficiencies of reason via sheer force of rhetoric (强词夺理). Of course, i could be proved wrong in short order; if so, things may get very interesting for the PRC’s relationship with the UNCLOS. I’ve also added in the page numbers of the article’s references to the tribunal’s Award on Jurisdiction. Obviously i’m not a lawyer and it’s a case where the fine-grain details are crucial, so i’d especially appreciate any corrections. On 12 July, an international arbitral tribunal will hand down its findings in a landmark case brought by the Philippines against China over the South China Sea issue. The decision will have far-reaching implications, not only for this contentious maritime dispute but also for international law and politics in East Asia. United States officials have expressed concern that the decision may exacerbate tensions in the region if China responds to an adverse finding with new assertive moves in the disputed area. However, contrary to the expectations of many observers, a total victory for the Philippines is unlikely. At least some key findings will probably favour China due in part to the political interest of the tribunal in protecting the status and relevance of the law of the sea in international politics. The case has been particularly contentious due to China’s allegation that the Philippines is “abusing” the UN Convention on the Law of the Sea (UNCLOS) processes. China’s subsequent refusal to take part in the proceedings, relentless propaganda campaign aimed at delegitimising the tribunal among domestic and international audiences, and its frenetic efforts to enlist statements of support from foreign governments, have created a backdrop that means the tribunal is unlikely to decide the case on legal merits alone. Even if the merits of the Philippines’ claims are strong, the arbitrators will be keen to avoid appearing to make a one-sided ruling. Instead, they will seek to make at least some concessions to China in order to neutralise Beijing’s political attacks on the tribunal’s authority, minimise the political fallout, and forestall the possibility of a Chinese withdrawal from UNCLOS. The latter scenario, while highly unlikely, would be a major disaster for the cause of international law, so it is likely to be among their considerations as legal professionals. The Philippines is also asking the tribunal to order China to drop any unlawful claims and desist from any unlawful activities (submission 15). In response, China argues that these matters are “in essence” issues of territorial sovereignty, which UNCLOS was not intended to govern, and maritime boundary demarcation on which China has invoked its right to reject compulsory dispute resolution. Beijing also argues the Philippines is legally bound by its previous “commitments” to settle its disputes with China through bilateral negotiations. However, in October 2015, the tribunal issued its preliminary award and found that it is competent to rule on at least seven of the Philippines’ 15 claims against China. In an official statement, China expressed anger at the ruling, this time accusing both the Philippines and the arbitrators themselves of having “abused the relevant procedures”. Notably, however, it avoided any suggestion that it was rejecting the UNCLOS itself. Numerous analysts, including many in Manila both inside and outside government, expect that when the arbitral tribunal hands down its final award, the ruling will find in favour of the Philippines. But as Phillipines legal academic Jay Batongbacal has noted, the tribunal had a strong incentive to accept jurisdiction over the case because doing otherwise would have been tantamount to an admission that UNCLOS is irrelevant in one of the world’s most important waterways, and one of its most dangerous maritime hotspots. However, the same considerations make a total victory for the Philippines unlikely. 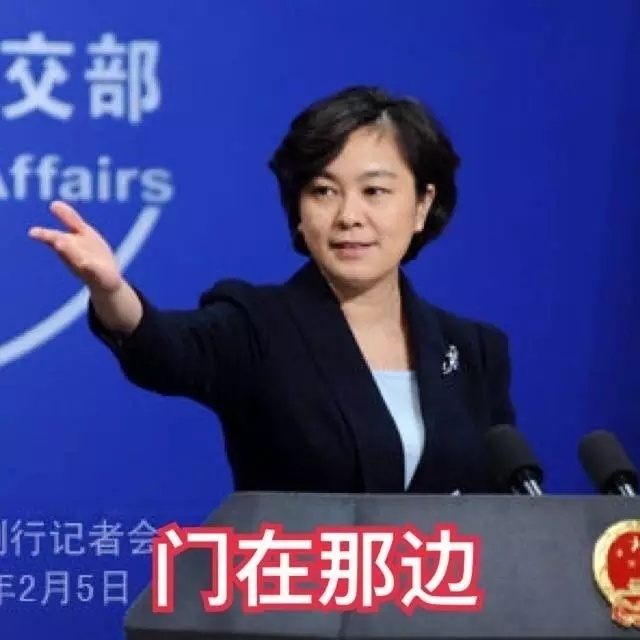 Not only would this outcome draw even more furious political attacks on the tribunal’s authority from China, a decision seen as one-sided would increase the rhetorical bite of Beijing’s international propaganda. The Award on Jurisdiction issued last October foreshadowed findings favourable to China on some key issues. For example, it noted that if China’s island-building and law enforcement actions are found to be “military in nature” then it may be unable to rule on their legality as these are excluded from the Convention’s dispute resolution procedures (p.140). Perhaps even more importantly, the Award (pp.62-63) also flagged the possibility of the tribunal providing an implied reading of the nine-dash line’s meaning for China: development that could effectively legalise the PRC’s infamously unclear and expansive claim. The case’s greatest significance may lie in providing the first legal precedent defining specific criteria for what constitutes an “island” (entitled to an Exclusive Economic Zone and Continental Shelf under UNCLOS), as opposed to a “rock” (which is only entitled to 12 nautical miles of territorial sea). Previous international legal rulings have deliberately avoided this question, but the Philippines’ submission has put the issue front and centre. The Award explicitly noted that “the Philippines has in fact presented a dispute concerning the status of every maritime feature claimed by China” in the disputed area (p.72). This suggests the tribunal may make the long-awaited definition. This would also accord with the arbitrators’ imperative to maximise UNCLOS’ relevance in international politics as it would help clarify the status of other disputed maritime rights claims in Asia and beyond, notably Japan’s claim to a 200nm EEZ around Okinotorishima. It is no certainty that this will happen. It remains possible that the tribunal would simply rule that there may exist one or more islands within 200nm of the relevant areas: a conclusion that would be sufficient to prevent consideration of the Philippines’ claims against China in those areas. Although the case is too complex to predict specific findings with certainty, the Philippines’ best hopes probably lie in obtaining an explicit rejection of China’s claims to “historic rights” and an affirmation that Scarborough Shoal—but not the much larger Spratly archipelago—is a rock and not an island, meaning the surrounding waters outside 12nm cannot be subject to any legitimate Chinese claim. US officials worry that the ruling may exacerbate tensions in the region if China responds to an adverse finding with more assertive moves. 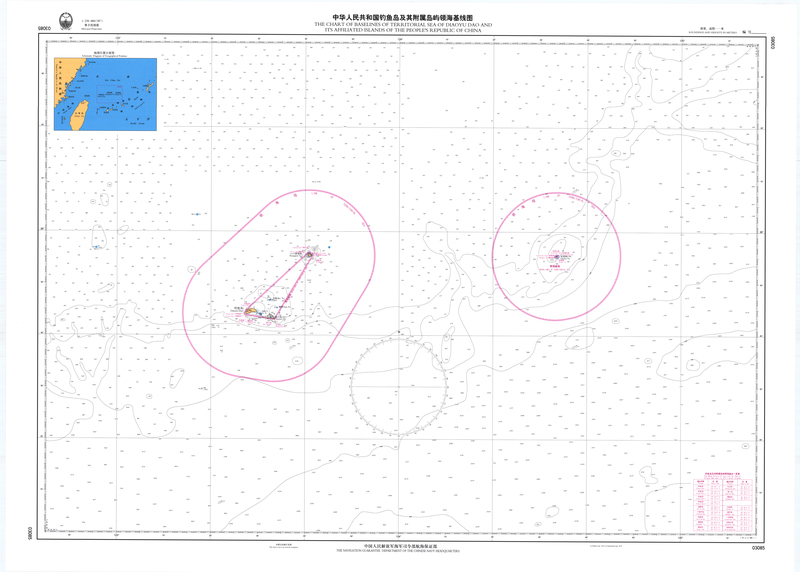 Reclamation activities at Scarborough Shoal and the declaration of an Air Defense Identification Zone in the South China Sea have been touted as possible responses. Despite China’s decision to ignore the tribunal’s verdict, it has major stakes in UNCLOS’ ongoing viability. These include deep seabed mining concessions in international waters and its outer continental shelf claim in the East China Sea. UNCLOS is also central to China’s argument that US naval surveillance activities off its coast are illegal. This leaves Beijing in the awkward position of trying to cast itself as a defender of UNCLOS while ceaselessly attacking an arbitration process constituted directly under its auspices. The continuation or even intensification of China’s political campaign threatens the global authority of UNCLOS as it seeks to divide signatory states into opposing camps. I may be proved wrong on Tuesday but I suspect the SCS tribunal’s arbitrators will be only too aware of this as they prepare their ruling.